Reef Runner Divers overs Dolphin, diving and snorkeling tours off the beautiful Caribbean coast of Costa Rica. 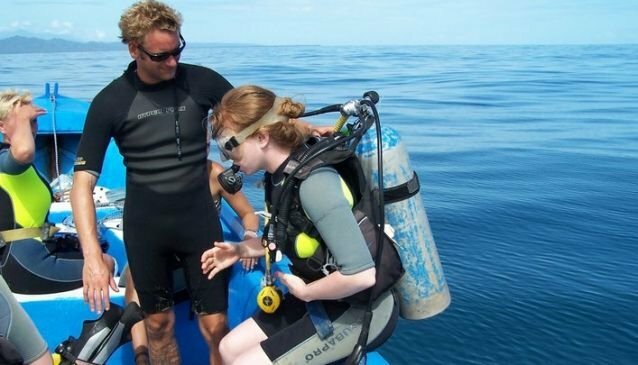 We can handle from expert to inexperienced, offering additional avenues for PADI certifications you may need. Our experienced and professional staff will make sure that you are ready for the adventures that can be seen under the crystal blue waters of the Caribbean. We are open 365 days a year, easy to find and offer online discounts periodically for booking an extended dive plan. Our dolphin tour offers something for everyone - scuba diving or snorkeling the waters in the early morning are great times to see the variety of dolphins that can be seen in the area of Punta Mona. This tour includes transportation to and from the boat, guide, lunch and beverages. With some of our other dive tours you will see Angelfish, parrotfish, triggerfish, sharks, nudibranchs and different species of jack and snapper are among the 475 species of discovered fish. Brown and black coral, sheet coral and lettuce coral are a few of the 31 discovered types of coral. Dozens of species of Sponges are also found on your dives. Come experience the beautiful Caribbean waters and join Reef Runner Divers for an exciting adventure.